In creating animals with boxes, start with a box which suggests the shape of an animal. A round oatmeal cereal box suggests the shape of an elephant. This elephant would be a great decoration for your room, especially if you make it in vibrant colors. Here is an attractive elephant that any boy or girl can make out of the following materials listed below. (1) Remove the cover from the cereal box and throw it away as you will not need it. (2) To make the elephant's head, stuff a wad of newspapers into the open end of the box. (3) Make the trunk, by pulling out part of the wad of newspapers used for making the head, and twisting one end of it. Make 4 holes in the bottom of the cereal box body in which to insert the legs. 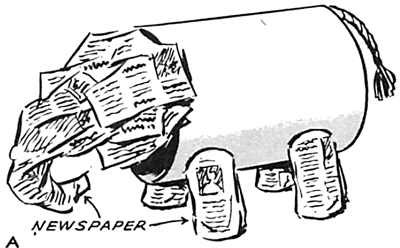 (4) Make the legs of short newspaper rolls, and insert them into the body holes, as in illustration A. (5) Cover the entire animal with strips of paper toweling over layers of wallpaper paste. (6) Make the elephant's tail of several strands of yarn braided together, ending in a frayed tassel. (7) Fasten the tail to the body by pasting it between layers of paper toweling. Allow the elephant to dry thoroughly. (8)Paint the elephant a solid color and allow it to dry. (9) Paint designs on the body in contrasting color paint. (10)Cut and then pin on, contrasting color felt flapping eyes. 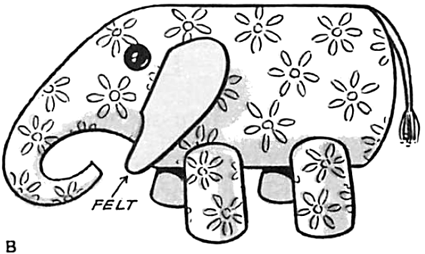 (11) Pin or glue on button eyes, as in illustration B.